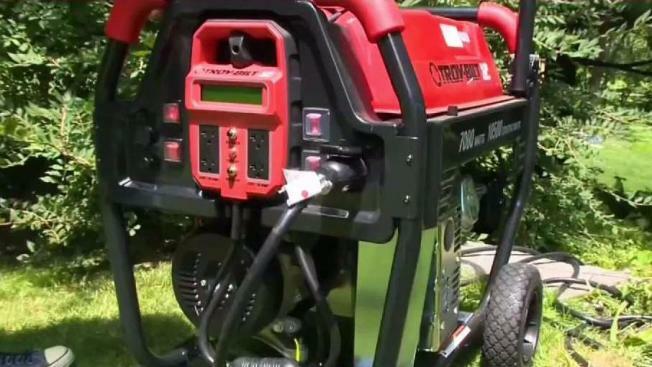 Many New Englanders have generators for when the power goes out because it's important to be prepared -- but it's also important to keep in mind safety tips to prevent fires, CO poisoning and electrocution. Safety officials recommend keeping the generator about 5-10 feet away from the home, and never inside of a home, basement, crawl space or garage -- even with the garage door open. The generator should face away from doors, windows and vents. It's also important to keep the generator dry, and allowing the generator to completely cool before refueling, because fuel spilled on a hot engine could ignite. Officials also recommend plugging appliances directly into a generator or using heavy-duty extension cords while not exceeding the number of outlets on the generator. As for fuel, safety officials say you should store gasoline in a shed or a detached garage away from the house, and never inside the home or an attached garage. They also recommend securing the shed or garage if possible, and keeping fuel out of the reach of children. Gasoline should also be stored far away from burning appliances such as furnaces, water heaters and/or woodstoves, because vapors can ignite. Click here for more safety tips and information about generators.